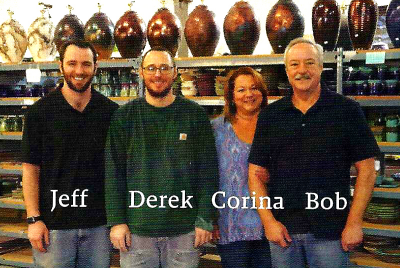 Clay in Motion is a family operated business owned by skilled potters Bob and Corina. Established in 1981, the studio produces over 100 beautifully decorated pottery items, all made on site. 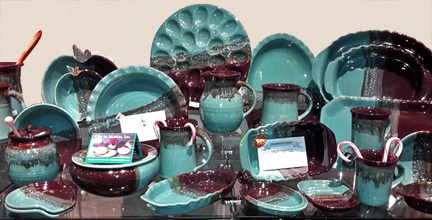 Located in the scenic Blue Mountains, they make traditional American pottery hand decorated in contemporary patterns and colors. "We strive to make beautiful, multi-functional pieces that are easy to care for and durable. Each piece is made carefully, paying special attention to quality and craft. We take pride in our quality, handmade stoneware. Our work is dishwasher and microwave safe, ovenproof and lead free. Each creative, user-friendly and functional item is fired onsite in large gas kilns to ensure quality and consistency. We are confident you will enjoy your pieces!"